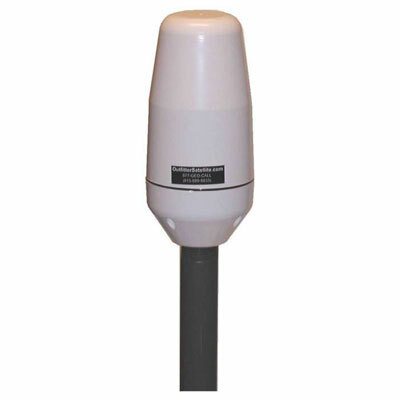 The Iridium passive mast antenna is designed for pole mounting to a standard 1" threaded pipe. It is a marine-grade antenna that can be used with all Iridium satellite phones and docking stations. It has a TNC (female) connector. An antenna cable is not included. Choose your antenna cable options above. IMPORTANT: During installation of the antenna, it is important to weatherproof the exposed TNC connectors between the Iridium passive mast antenna and the antenna cable. This prevents moisture and salt water intrusion into the connection which can cause corrosion. For most applications, we recommend Coax-Seal Tape (hand moldable plastic) or a similar product. Q: Your antenna is designed to be mounted onto a 1" threaded pipe. Will the TNC connector for the coax cable fit inside a 1" threaded SS pipe so that it is protected from the elements? A: Great question. The TNC connector and cable fit nicely inside of the antenna base. I have added an image to the product image gallery for your to view. Thanks for the questions. Q: Can you supply a threaded pole to use with the antenna? A: Hello. We do not supply the pole; however it is threaded with standard 1" plumbing threads, so you can get any customer length you'd like from a normal hardware or plumbing supply company. You can use galvanized or PVC. Q: Is this product TAA compliant and can you provide the country of origin? This product is produced in California, Made in the USA. Q: Does this act as an antenna for both Iridium and GPS? A: Hello. 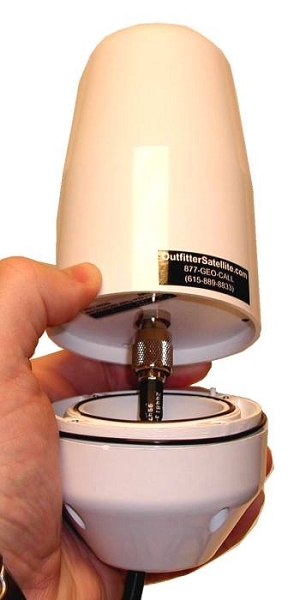 This particular antenna does not have the GPS capability, although there are other options for that. Q: What is the maximum recommended distance between the antenna and base station? My office base station location will be on the roof, approximately 250 feet from the antenna. Can a 250 feet coax be purchased and installed to sufficiently support full operations of my 9505A? A: Hello. For long cable runs like this, you have 2 options. The longest cable run is approximately 70 meters; this would require a powered, filtered antenna with lightening arrestor. See here: https://www.outfittersatellite.com/ASEDK075.html. Your better options would be to mount your 9505A in a dock close to the roof, run a short antenna cable run to the roof, then run a standard POTS phone line to a desk phone in your office. Give us a call during business hours and our sales team would be happy to formulate a custom solution for you and weigh your options.